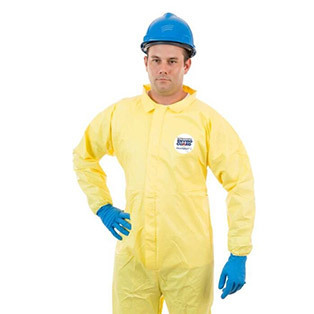 Our selection includes disposable protective clothing that have been tested using ISO 6350 and EN 368 protection standards for penetration and repellency Our protective clothing for chemical splash protection are engineered for better fit, mobility and heavy-duty work for less ripping or tearing. With International Enviroguard, you have Comfortable Confidence® to safeguard your workers from chemical splashes with protective clothing that fit your people and your budget. This chemical splash barrier is designed for use with stronger acids and caustics. ChemSplash® 2 fabric is lighter and more pliable than many competitive fabrics, providing better comfort and mobility for the wearer. 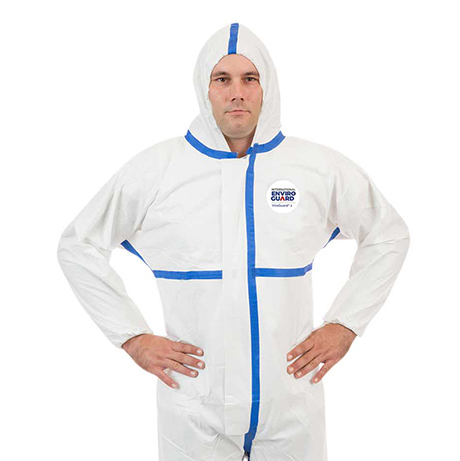 Utilizes a proprietary laminated fabric with a broad range of chemical protection. Offers significant physical strength for workers who need a wide range of movement while working in demanding chemical work situations. Is perfect for workers in general chemical and petrochemical environments. 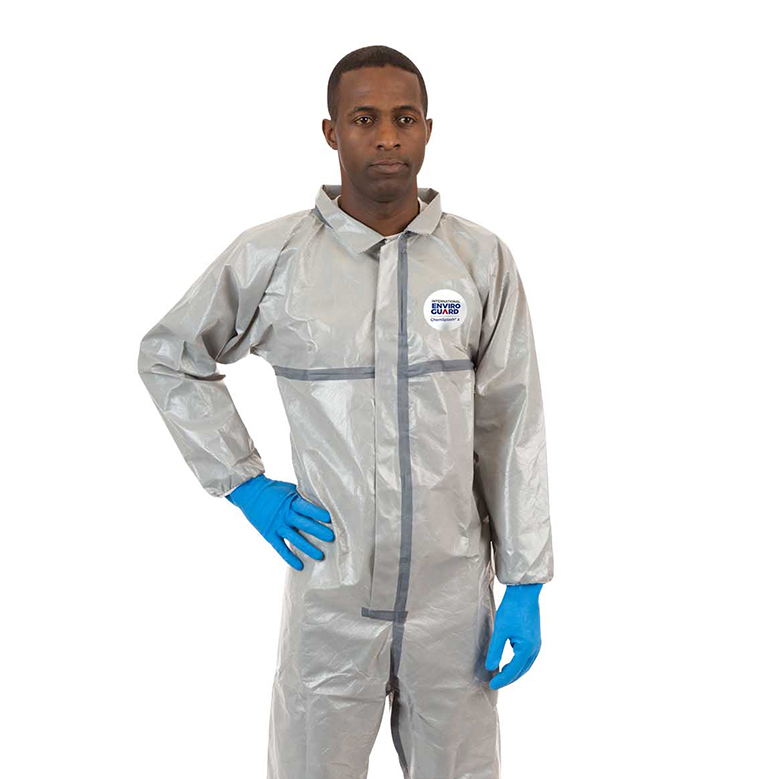 ViroGuard® protective apparel offers superior comfort and performance in a disposable product. 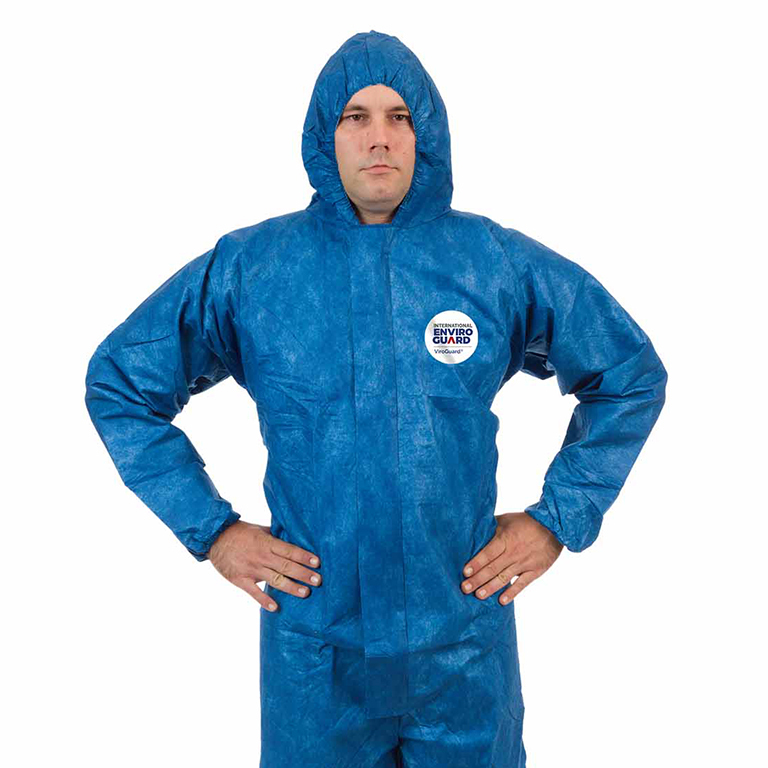 Enhanced moisture vapor transmission keeps workers comfortable and protected. Seamless shoulder area provides significantly more room, allowing workers to freely move their arms and shoulders without ripping or tearing. Elastic back stretches with the user for more comfort and better tear resistance. No need to purchase a larger size just to have more fabric in the back. Gusseted, reinforced crotch provides more room to move in all directions without ripping or tearing. Blue fabric makes stains and splashes on fabric less conspicuous. ViroGuard® fabric passes ASTM F1670 and F1671 tests for protection against blood, bodily fluids and bloodborne pathogens. Range of options available in coverall and lab-coat styles. ViroGuard® 1 offers enhanced blood and blood-borne pathogen protection with taped seams. ViroGuard® 1 fabric passes ASTM F1670 and F1671 tests for protection against blood, bodily fluids and blood borne pathogens. Taped seams provide additional protection. Thumb loops at the cuff help prevent sleeves from riding up and exposing the wearer. Zipper front features a sealable storm flap.